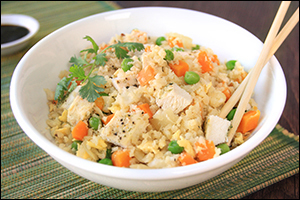 Forget that drawerful of restaurant menus -- it's time to make fried rice with chicken, right in your own kitchen. Okay, it's neither fried nor rice, but boy, does it ROCK. Season chicken with salt-free seasoning, and lay on the baking sheet. Meanwhile, working in batches, pulse cauliflower in a food processor or blender until reduced to small rice-like pieces. Chop cooked chicken into bite-sized pieces. Place in a large bowl, and cover to keep warm. Bring an extra-large skillet sprayed with nonstick spray to medium heat. Scramble egg whites/substitute until fully cooked, about 3 minutes, using a spatula to break it up into bite-sized pieces. Transfer to the large bowl of chicken, and re-cover to keep warm. Remove skillet from heat; clean, if needed. Re-spray, and bring to medium-high heat. Add frozen peas and carrots and 2 tbsp. water. Cover and cook for 3 minutes, or until thawed. Add cauliflower, onion, sesame oil, and garlic to the skillet. Cook and stir until veggies have mostly softened, 6 - 8 minutes. Add scrambled egg whites/substitute, chicken, and teriyaki marinade/sauce. Cook and stir until hot and well mixed, about 2 minutes. 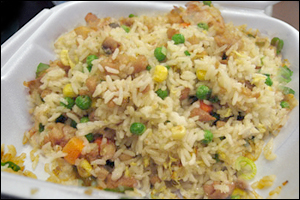 Hungry for More Chinese-Food Swaps?